The name Fáschom properly refers to the next coom immediately south of Coumshingaun. 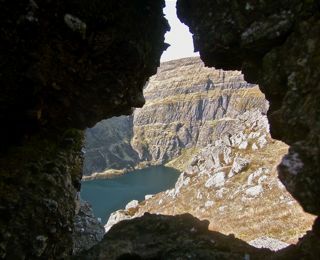 The name may refer either to its wild nature or to the fact that, unlike many of the cooms which cut into the Comeragh plateau, it has no lake. Knockaunapeebra / Cnocán an Phíopaire is the name of a a lower peak to the SW. Kilclooney Mountain is the highest mountain in the Comeragh Mountains area and the 48th highest in Ireland. Kilclooney Mountain is the second highest point in county Waterford.